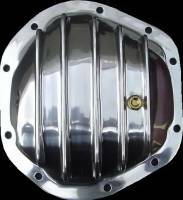 Dana 44 - Polished Aluminum Differential Cover - - Choose from over 32 different colors, drain/fill plugs and gasket type. Fill Plug and Fasteners Included. Dana 44, 8.5 RG, 10 Bolt differentials. Used on the front of the following vehicles: Ford 1959-1979 1/2 Ton (F-100/F-150), 1980-1996 1/2 Ton (F-150); Dodge 1974-1993 Ramcharger, 1980-2001 1/2 Ton (W150/1500), 1988-1995 3/4 Ton (2500 Light Duty); International Harvester 1971-1980 Scout; Jeep 1974-1991 Wagoneer, 1974-1983 CJ-5/7, 2003-2010 TJ Wrangler Rubicon On the rear of these following vehicles; Jeep 2003-2010 Wrangler Rubicon, 1997-2006 Wrangler, (optional: available starting 07/07/1997), 2007-present Wrangler (optional on 2007, standard '08-present), 2007-Present Jeep Unlimited. IHC Scout 1971-1980. The Dana 44 axle has been widely used by numerous manufactures on numerous models, it is the most widely used axle for four wheel drive vehicles. Do not get this confused with the Dana 44A widely used on the Grand Cherokee SRT8 , The Dana 44 on this page measures aprox. 9.5" across (wide). 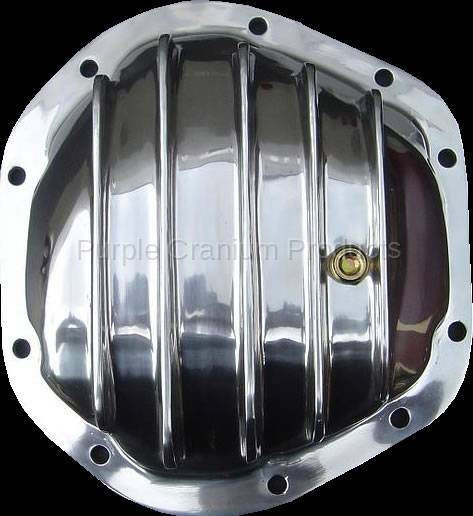 PCP lets you build your Chrome Differential Cover here on our site; choose the color, drain and/or fill plug and gasket type. It is a difference you can actually feel! remove one (1) bolt let drain and replace that one bolt…hands do not even get dirty.